La Paz, September 18th 2008 - The leadership of the Central Obrera Boliviana (COB) has declared that it does not approve of the negotiations president Evo Morales today opened with the fascist governors and the oligarchy in search of a great national accord. “We do not agree with these negotiations”, COB official Mario López said this morning in La Paz, minutes after the formal opening in Cochabamba of talks between Morales and the fascists governors who rule four of the country’s nine provinces with an iron hand and extreme violence. “They [the fascists] are going to continue their blackmails (…) The president must meet with the people and not with the representatives of the oligarchic right-wing”, added López, representing the leadership of the COB, the united trade union federation which organises all workers in the cities and in the countryside. With this public statement against the negotiations between Morales and the fascist governors, López brought to mind the criticisms and questions raised by the miners and by other radical unions who have rejected the political support the COB leadership yesterday offered to the Morales government. On Wednesday the pro-government COB leadership, without consulting the strongest and most militant unions and federations, had given its backing to the Morales government and signed the so-called “Unity Pact”, which was interpreted as an endorsement of the negotiations Morales is holding, starting today, with the fascist oligarchy in search of a national accord. The COB leadership’s deal with Morales was in defence of democracy against fascism and in support of the new State Political Constitution, which maintains the right to private property, foreign investment and capitalist development. Guido Mitma, executive secretary of the militant and powerful Federación Sindical de Trabajadores Mineros, eschewed such a deal and said that the COB leadership’s action had been “unilateral and fake” and that it compromised the political independence of the workers and their socialist project. “For us, this [the pact between the COB leadership and Morales] is a political problem and us workers cannot let it lie. Out of principle we refute the actions of comrade Pedro Montes (the leading figure in the COB), who made an fake pact with the government”, he stated. Furthermore, the miners’ federation leader raised questions over the dialogue and negotiations Morales’ government is holding with the oligarchy. “The dialogue he is advertising is subject to conditions, and we would raise questions over comrade Pedro Montes’ tolerance of this. As mineworkers and trade unionists, we are disturbed by this”, he added. Mitma also criticised the pro-government leaders of COB for signing an accord with Morales along with union organisations other than those officially recognised by the Central Obrera. “We will always defend democracy, but not in the fake manner of comrade Pedro Montes or by making deals. The miners will take the lead in defending the country’s territorial integrity and democracy”, he said, making clear that nothing good for the workers or the country would come from negotiations and concessions to the oligarchy. The miners’ leader warned that the politics of conciliation with the bourgeoisie would not benefit either the people or the reform process. On the contrary, he urged the entrenchment of the so-called ‘October agenda’, i.e. the true nationalisation of un-renewable natural resources which are still in the hands of multinationals, the expropriation of the immense latifundios [large agricultural estates] in the east and in the valleys, the re-distribution of land to the poor indigenous people and peasantry, and improvements in working conditions and living standards for workers. Mitma said that the workers’ revolutionary position on the oligarchy and the fascist governors had been advocated by several FSTMB and Huanuni miners’ assemblies. In these assemblies, before the advance of fascism and the right, the miners publicly proclaimed the need for “the minorities we crushed in 2003 and 2005 to be eliminated once and for all, as these are the financiers of the anarchy and crimes carried out under the great smokescreen of regional autonomy. The written and spoken press, in its majority, lies in the hands of these scroungers, who use it to spread disinformation, distort the truth and foment discord between class brothers. “Our struggle must be directed at cutting off the sources of the economic power of this oligarchic and landowner minority. This means fighting for the implementation of the demands raised in 2003 and 2005, nationalising the multinational companies and taking back privatised businesses. This will strike a deadly blow against the wealthy, stop the carve-up, generate jobs and overcome the poverty which capitalism and neoliberalism has long subjected us to. “The government must not be irresponsible and avoid taking this path. Enough of working with the conspirators and those who sabotage the real process of change! Change must not be an empty slogan but rather should mean structural change to take back our natural resources: these should be extracted by the state under social control. Nationalising and developing our wealth must be the immediate objective. Experience shows that this can only be done via the state”, argued the miners’ resolution. But this is not the perspective of Morales’ government, which has devoted itself to making a far-reaching accord with the fascists which would allow it to govern the country, or at least, access to the east and the valleys, where the oligarchy has established rebel governments and will not even allow the government entry. “The president has asked them [the opposition governors] to allow dialogue to go ahead without interruptions. We will work here for the next four or five days, and longer if necessary, until we makes agreements at the meeting which will bring results for the country”, said the presidential spokesperson Iván Canelas. Holding to a truce with the fascists, the Morales government hopes that the electoral support it won on August 10th (67%) and the mass popular condemnation of the massacre committed in the east (with a tally of 15 dead, 30 wounded and the imprisonment of the genocidal Pando governor Leopoldo Fernández), will oblige the governors and the oligarchy to sign a great national accord. 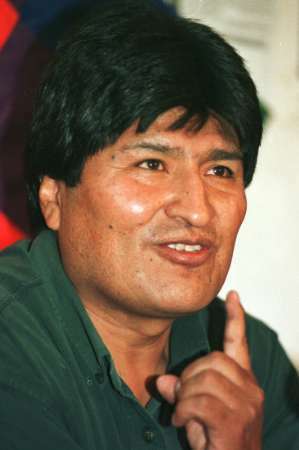 Morales, who represents the traditional interests of small producers and the proprietors of small farms in the countryside and workshops in the towns, wants an alliance with the oligarchy and the 100 clans, who own the land and the economy, to preserve representative democracy and strengthen the functioning of Andean capitalism: a political and economic model based on private property as regards foreign investment, the strengthening of the ‘national bourgeoisie’ and small private producers, with state support and intervention. He also wants to achieve the ratification of a new Political Constitution which will grant - at least in formal terms - more rights for the indigenous peoples, will push along the capitalist development of Bolivia and open the way for his re-election up to 2020. The fascist right, in contrast, conscious that holding the indigenous president hostage has allowed it to recover its power in half the country, now does not want any deal with Morales, still less his new Constitution and possible re-election, and is counting on wearing him down and stopping him staying in power beyond 2010, when his five-year term in office will officially end. In truth, the oligarchy does not want to sign accords with Morales and for this reason is putting forward a set of demands which could only be fulfilled if Morales totally caved in. So they demand that the government ‘devolves’ hydro-carbon taxes to them (around 200 million dollars a year), ceases from promoting the new Constitution and recognises their statutes of autonomy (allowing them to create their own Parliament, decree laws parallel to nationwide laws, collect taxes and create their own Police). Given these conditions, an accord between Morales and the fascists seems far from probably, including in the eyes of the unions which are defending Morales top and tail. So, for example, Edgar Patana, who leads the Central Obrera of El Alto and who has also signed the deal supporting Morales, says that the oligarchy is only buying time in order to stymie the wishes of the people. “In the negotiations, they [the fascist governors] are only interested in blocking the new Constitution, continuing to hold onto the land and stopping the re-election of the President. These are issues they will not let lie”, he said. 1. To defend the unity of the motherland, which is being attacked and undermined by the right-wing coup led by terrorists and fascists supported by the governors, who want to break the unity of Bolivia in order to hold onto their privileges, to the detriment of the dispossessed classes among our people. 2. To defend democracy, won at the cost of much struggle and much blood by the workers and the people in general, a conquest threatened by the terrorists and fascists who attack Bolivians’ institutions and way of life. 3. We support and defend the revolutionary process of change in search of equity, equality and social justice led by our brother, president Evo Morales Ayma, in order to build a new motherland with the ratification of a new State Political Constitution. 4. Rejecting fascist and neo-Nazi hatred and racism and the attitudes of the governors and neo-liberal leaders who, financed by the US embassy, have paid for groups of paramilitaries and fascists to beat up, throw rocks at and murder our peasant and indigenous brothers. 5. Taking over unproductive latifundios as well as their means of production and the factories with which they gamble with the hunger of the people. 6. We salute the revolutionary attitude of president Evo Morales Ayma and his expulsion of the ambassador of Yankee imperialism from our country. Doing this for the first time in Latin America’s history, taking such a stance has brought dignity to the peoples and their sovereignty. 7. We demand the bringing to justice and imprisonment of Leopoldo Fernández for his terrorist and genocidal crimes.